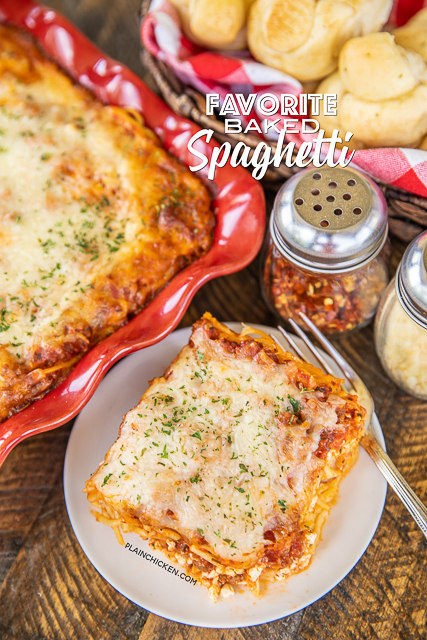 Baked spaghetti casseroles are a favorite in our house, and this is our Favorite Baked Spaghetti recipe. SO cheesy and delicious!!! This a great make-ahead meal. Since there are only two of us, I usually split the casserole between two 9x9-inch foil pans. I bake one and freeze one for later. LOVE easy freezer meals! 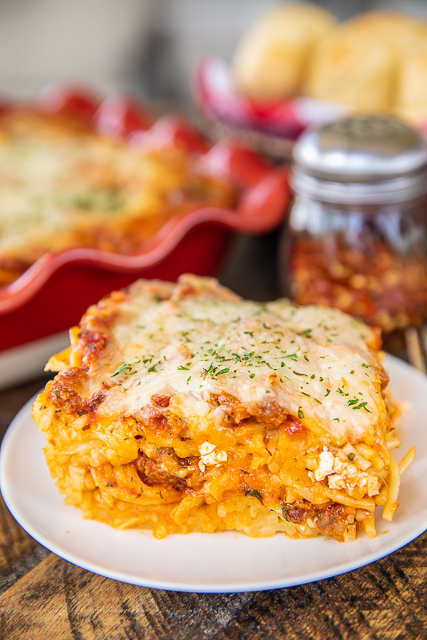 I used Italian sausage in this Favorite Baked Spaghetti casserole, because it is my favorite. If you don't like sausage, go ahead and swap it out with beef. Just add some Italian seasoning to the beef to give it more flavor. 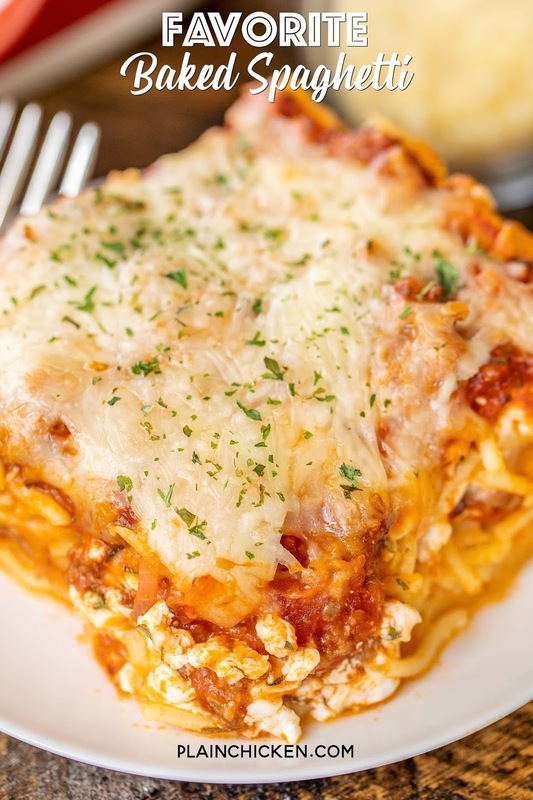 I like to use Trader Joe's Roasted Garlic Marinara in this Favorite Baked Spaghetti casserole. It is the one with the green label. It tastes great! If you don't have a Trader Joe's close by, I also love Rao's and La Famiglia Delgrosso brand jarred sauces. I find both of those at Walmart, Target and Publix. I also linked to them in the recipe. 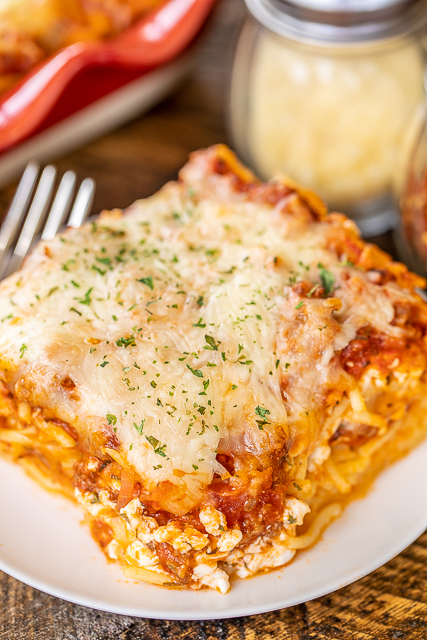 This Favorite Baked Spaghetti is a favorite in our house. We love all the flavors and the cheese!! 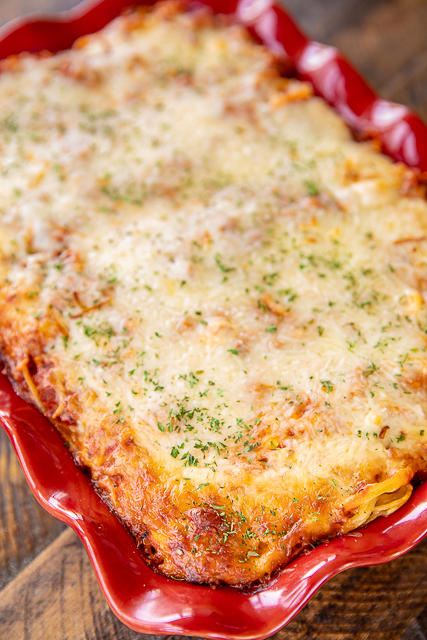 This Favorite Baked Spaghetti is great for potlucks, dinner parties and homemade gifts! This is one of my go-to meals I take to friends having surgery or a new baby. While spaghetti cooks, cook Italian sausage in a skillet over medium-high heat until no longer pink. Drain fat. Stir in spaghetti sauce and tomato sauce. Check seasoning. Add salt and/or pepper to taste. Set aside. In a large bowl, whisk together eggs, parmesan cheese and melted butter. Add cooked spaghetti and toss to coat. Place half of spaghetti mixture in bottom of baking pan. Top with half of cottage cheese, half of meat sauce and half of mozzarella cheese. Repeat layers. Cover with aluminum foil. Bake for 30 minutes. Uncover and bake an additional 20 to 25 minutes. Garnish with parsley, if desired. Could I sub ground beef? I already have some in freezer!!! Love a recipe that you can work once and eat twice! My husband does't like it when I try to make us eat leftovers three nights in a row to use it up, hehe. Definitely will try it! If you are freezing, will you need to thaw before baking or can you bake from frozen? Thank you. Can't wait to try this! Looks soooo yummie.. Definitely a must try dish ! How long can it be left in the freezer. I've never been a big fan of baked spaghetti, but I will admit this dish was well worth the effort and I must applaud you. I did alter it somewhat, as I make my own sauce (have for years. All in all it was great. The smell throughout my house brought the family running to the table. Thanks for sharing. Looking forward to trying more of your dishes soon.